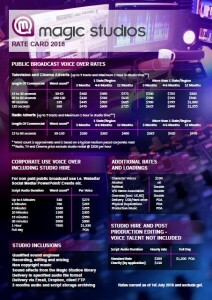 We have extremely competitive voice over recording studio hire rates and packages. For Magic Studios pricing please Click to Download Pricing and Packages pdf . The studio’s come fully equipped with a sound engineer to get the most out of your voice over project. To view our pricing please click on the thumbnail below.